Golf Digest compiled the list Top 100 In Music and included M.Shadows. You will see two exclusive photos, here and here. Avenged Sevenfold frontman loves golf's traditions, "even the stuffy ones." 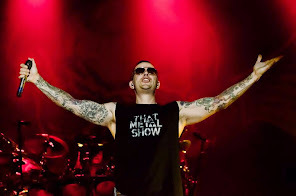 When their manager talked rocker members of California-based Avenged Sevenfold into hitting balls at a golf-resort concert venue in 2007, lead singer M. Shadows jumped at the chance, thinking it would be easy. What has kept him coming back to the game is how hard it turned out to be. As with music, excelling is what he's about, and he has the hours logged with golf-pro buddy Scott Osterhout to prove it. Shadows (real name: Matt Sanders), 33, who often invites Osterhout to travel with him, says golf is factored into tour planning.